The new issue of the Arthur Machen journal, Faunus, has just been issued to members of the Friends of Arthur Machen. Issue 26 of the hardback journal includes Thomas Kent Miller's comprehensive survey of the meanings of Machen's enigmatic story 'N'; John Howard's explorations of a key Machen motif, geographical and spiritual boundaries; Godfrey Brangham's recollections of browsing for Machen in obscure bookshops; and an unpublished essay on Machen by the Nineties authority Derek Stanford. There's also an essay on a vituperative feud against Machen by the Edwardian journal The New Age, together with a previously undiscovered portrait of Machen in the futurist style. Accompanying Faunus, Gwil Games' Machenalia newsletter has the usual cornucopia of Machenesque news and announcements, including details of events planned to mark his 150th anniversary next year. To join the Friends of Arthur Machen and receive the journal and newsletter, please visit the Friends of Arthur Machen website. In 2004 Theo Pajmans and I published an article in All Hallows about the 1930s thriller writer, R.R. Ryan. We revealed the existence of the book contracts for R.R. Ryan in the archive at Random House. The contracts indicated that, in addition to the seven novels that he published under his own name, R.R. Ryan wrote four novels under two pseudonyms, Cameron Carr and John Galton. At that time Random House would not release any personal information about Ryan for privacy reasons, so we were unable to establish the identity of the author, though we suggested a couple of possibilities, the actor Cameron Carr, and Rachel R. Ryan, who wrote a book about the city of Manchester in the 1930s. In 2008, Random House agreed to release the personal information in the contracts in response to an access request. All of the books are contracted to R.R. Ryan of 16 Granville Road, Hove, Sussex, except No Escape, Ryan’s last novel, which is addressed to 80B Lansdowne Place, Hove, Sussex. The contract for No Escape is dated 17 November 1939. A letter dated 3 March 1939 indicates that R.R. Ryan accepted an offer assigning copyright for all three names to Herbert Jenkins, now controlled by Random House. The last correspondence in the R.R. Ryan file is a letter from Mrs Anne Ryan, R.R. Ryan’s wife, dated 1 August 1956. The letter is addressed from 80B Lansdowne Place. The letter appears to be a response to a letter dated 30 July 1956, which is not extant. In the letter Mrs Ryan accepts an offer made by Herbert Jenkins, but it is not clear for what, though it is conceivable the offer is for the copyright of No Escape, which was contracted after Ryan sold the copyrights of his other books to Jenkins in March 1939. The Hove electoral registers reveal that a man named Rex Ryan lived at the Hove addresses with his wife, Anne. Local directories confirm that the Ryans lived at these addresses. Mrs A. Ryan is listed in Pike’s Directory for 1939-40 at 16 Granville Road. Kelly’s Directory for 1947 and 1951 lists Mrs R Ryan at 80B Lansdowne Place, and lists Mrs A. Ryan at the same address for 1964 and 1966. Evelyn Bradley who was born in Waterloo, Lancashire on 14 December 1882. His birth certificate was registered in September 1883. He was the son of Walter Bradley, described in the 1891 census as a retired African merchant, who was born in about 1849, and Alison Bradley, born in about 1857. Evelyn had two siblings, Arnold and Norah. The 1891 census also lists Mary Webster, a school governess, as living with the family. In that year the family were living in Cheadle in Cheshire; the 1901 census has the family living in Ripponden in Yorkshire. Evelyn Bradley was a theatre manager, actor, and playwright, and his knowledge of the theatre appears in his books; a number of his protagonists are actors or aspiring actors, there are frequent theatrical references in his books, and A New Face at the Door, under his Cameron Carr pseudonym, concerns the members of a repertory company in a provincial theatre. Rex Ryan may also have written The Twister, another sensational play, which was set in Chang’s Torture Chamber and featured cocaine gangs. The play was licensed in September 1928 for the Grand Theatre, Brighton, close to where Ryan lived and worked. Interestingly, Ryan’s wife was Anne Howard, whose mother was Zoe Beatrice Howard, formerly Redgrave, and related to the famous acting family. Anne Ryan died in about 1970 and evidently destroyed all of her husband’s papers. 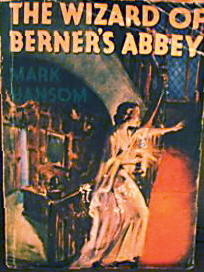 The Wizard of Berner’s Abbey is the second of Mark Hansom’s seven novels, all of which were published by Wright & Brown of London between 1935 and 1939. It came out in May 1935, following the November 1934 publication of The Shadow on the House, an unambitious but readable thriller. Original Wright & Brown editions of the seven Hansom novels are extremely rare, as are the seven paperback reprints done by Mellifont Press between 1939 and 1951. According to the British Museum Catalogue, at least some of the Mellifont Press reprints were abridged. I have not been able to compare the texts of the two editions of The Wizard of Berner’s Abbey, but if the Mellifont edition (which contains approximately fifty-six thousand words in twenty chapters) was abridged, as I suspect (owing to the hazy details of certain aspects of the plot), the cutting was an act of mercy towards the reader. The Wizard of Berner’s Abbey is a considerable step down from Hansom’s first novel, a descent into hackwork. It is the first person narrative of John Richmond, a student of medicine aged twenty-four, who comes unexpectedly to a little Surrey village to visit his cousin, Leonora, who had jilted him two years ago to marry Paul St. Arnaud, a sinister and much older figure completely absorbed in scientific inquiry. John hopes to come to understand why Leonora turned against him and towards the repellant St. Arnaud. What John discovers is that St. Arnaud believes that his own will is so great that it works in complete independence of his body. St. Arnaud, however, is soon dead and buried, though his influence over his wife, via some sort of mind control, remains. And Leonora unwittingly continues her late husband’s nebulous experiments to create life—these experiments have something to do with the murders of two young women, for evidently brain matter is an essential part of St. Arnaud’s methodology. Meanwhile John explores St. Arnaud’s library, which contains various occult books, and after reading in one of them John decides that some kind of vampirism is involved with regard to St. Arnaud’s strength of will. Much of this kind of exposition is padding and deflection. It turns out that St. Arnaud has faked his own death, but is in the end killed in a struggle, leaving John and Leonora to marry. The reader reaches the final page with relief that this tedious novel, poorly executed and entirely without thrills, is at last finished. Nothing is known of the author. It is possible that the byline is pseudonymous. Though there are many people with the last name of Hansom in England (particularly in the north), there is no “Mark Hansom” of the appropriate age to be found in the death records for England and Wales from 1938 through 2005. I am now able to confirm, by comparison with the Wright & Brown original (courtesy of James Doig), that the Mellifont edition of The Wizard of Berner’s Abbey is, as I suspected, significantly abridged, and I am able to make some generalized statements about Mellifont’s process of abridgement, which (presumably) is common with other Mellifont texts. Basically, what the editor at Mellifont seems to have done is to cut whole paragraphs throughout the book, mostly of narrative description. In some instances, a sequence of paragraphs, including some dialogue, might be excised wholly, even running to a number of pages; but for the most part, it was common for a paragraph or two to be snipped out here and there in each chapter to reduce the amount of text enough to fit in the standard Mellifont 96-page format. Additionally, all italics in the original Wright & Brown edition are dropped from the Mellifont. As an example, here are my notes about the cuts from the twenty chapters of the Wright & Brown edition of The Wizard of Bernard’s Abbey. Very occasionally one sentence might be cut out of a paragraph otherwise retained in the Mellifont edition (marked with a + below), or a sentence from a paragraph otherwise excised might be retained (such instances are marked with a - below). I think it’s safe to call the Mellifont edition hacked to pieces! The currently available edition published by Ramble House is reproduced from the Mellifont edition, and thus identically abridged. Potential readers are hereby alerted! Wormwoodianaites would know of R. Ellis Roberts through a couple of stories anthologised in Dorothy L. Sayers' sublime Great Short Stories of Detection, Mystery and Horror series. Surely his scarce collection, The Other End, is deserving of a reprint in these enlightened times. Here is a contemporary review that appeared in The Bookman in March 1923. There is said to be joy among authors when a critic writes a novel or a book of short stories. “Now,” they say in their hearts, “he will give himself away. It is easy for him to point out the flaws in our art and tell us how to do it, but he will not find it so easy to demonstrate how it ought to be done." Any such joy will, in this case, be short‑lived, for “The Other End" proves that Mr. Ellis Roberts is as well able to write stories of his own as to criticise those of others. Here, moreover, he has set his hand to a kind of story-telling that is not often practised successfully and achieved a mastery, at times, over the grim, the terrible, the eerie, the bizarre, over the fine, elusive mysteries of the spirit, that challenges comparison with Poe and Hawthorne. For all the uncanny air that enfolds these stories, the supernatural elements in them are so quietly taken for granted, and am blended with so much of everyday circumstance that even their unrealities are made to seem curiously real. Mr. Roberts paints you a conventional, smiling English landscape, then by gradual, subtle wizardries touches it with secret, twilight terrors. He finds the gods of ancient Rome still haunting the English countryside where their alters and temples had stood; finds the altar magically re‑erected, the sacred fire burning on the lonely hill in the deep of the night, and a strange worshipper, who had seemed by day an ordinary herd‑boy, offering up sacrifice; finds the gods themselves returning to influence mysteriously, tragically, the lives of present‑day men and women. In "The Great Mother," Hugh Flinders asks his friend: “Would it surprise you to know that the old worship goes on? That hills near here are still sacred to Apollo? That groves are still dedicated to Diana, and woods to Pan? I don't mean stupid revivals like old Taylor's: I mean survivals of the old faith among the old people ‑ people to whom Christ and the saints are less direct of access than earth-stained Pan, gross Priapus, or even Jupiter of the storm. For months now I have resisted and I can resist no longer. I am going to the grove tonight: and I should like you to come too, it you will. Will you?” The amazing happenings that night at the grove ‑ the baffling disappearance of Hugh, the rush of frenzied dancers, with nothing to be heard but the swift padding of many feet, and nothing seen but the long, rank grass beaten down as by a storm of hailstones ‑ the whole thing, with its matter-of-fact ending, which leaves the wonder unexplained, is done with an art, an imaginative cunning that is rare in modern fiction. These occult influences of the ancient world are potent in “The Hill,” the piteous tragedy of “The Other End,” “The Wind,” “Under the Sun,” and other of the tales; but it is a different wizardry that is practised by the saintly priest, Lascelles in "The Narrow Way," another sort of spirit that haunts the high road in "The Cage." Any summary of the stories would misrepresent them; they depend so much for their effectiveness on the atmosphere in which they are steeped, on little details of character and incident that, subtly touched into them, subdue the reader to a belief in their bizarre happenings. Some are edged with a delicate irony, or have charm as well as mystery and terror; the best show a power of fantasy and a deftness of finish which seem to indicate that Mr. Ellis Roberts has too long given to criticism what was meant for imaginative literature. Valancourt Books have announced a new series of 20th Century Classics, which includes quite a few reprints of rare ghostly, supernatural or fantastic novels. Titles lined up include I Am Jonathan Scrivener by Claude Houghton, introduced by Michael Dirda; a range of volumes by John Blackburn; The Witch and the Priest by Hilda Lewis; The Hand of Kornelius Voyt by Oliver Onions; He Arrived At Dusk by R.C. Ashby; and Flower Phantoms by Ronald Fraser. The books will all be reset and have new introductions. The list looks like it will prove a good opportunity to read some fine, hard-to-find, but neglected work, and I'm pleased to be involved with introductions for some of them. Labels: Claude Houghton, Ghost stories, Mark Valentine, Oliver Onions, Ronald Fraser.